The inner plot going on from starting of the movie was nice, Guy pearce, the original Gajini in hollywood done his part very well. And Pepper parts done some action at the end. The plane sequence was great actually. Imax 3d experience was good. If you start comparing with previous parts, then it will definitely loose with others. 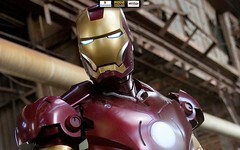 Iron Man got the second highest weekend collection at box office after Avengers. and not for those who need high emotional resonance movies. Overall, you can watch in Imax 3D for one time. You can satisfy with what they have shown, but you didn't get thrilled much. yes, the use of Ben Kinsley was effective. btw it is a nice review.